The Hoodoo Site is located in the Canyon Pintado National Historic District near Rangely, Colorado. 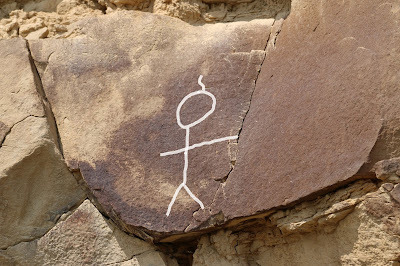 The site is one of the stops along the Rangely Rock Art Tour which includes over a dozen other places with a large assortment of petroglyphs and pictographs dating from the earliest Archaic to the latest Historic periods. 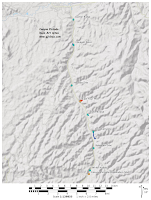 The trailhead is located along Highway 139 near mile marker 63 about nine miles from its junction with Highway 64 on the eastern outskirts of the town of Rangely. 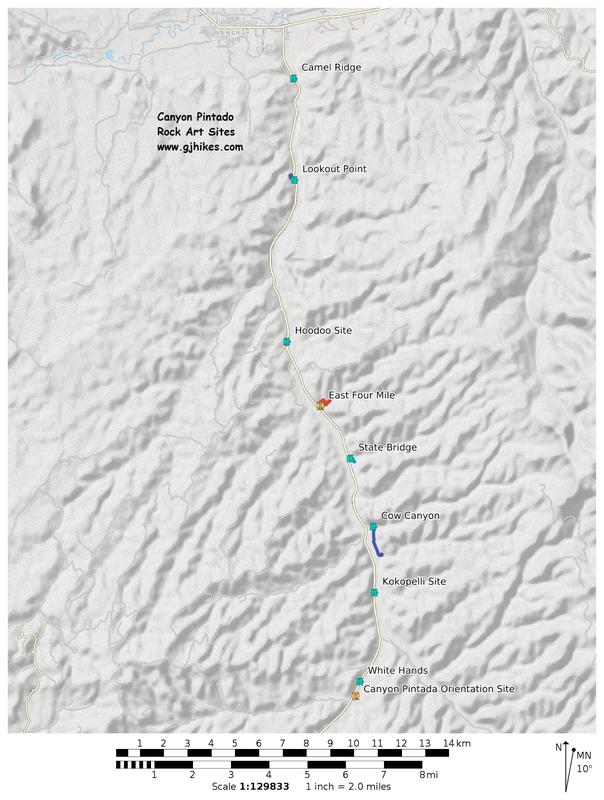 At present there isn't a sign at the site and it doesn't appear on any of the official Canyon Pintado maps. We call it the Hoodoo site because there are two hoodoos on the cliff above the rock art. After parking along the shoulder of the highway and passing through the gate head toward the coral pole fence that protects the rock art. 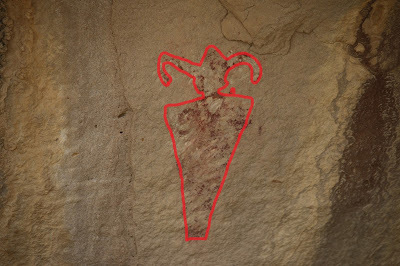 The images at the Hoodoo site are in the Barrier Canyon style. We outlined the images on the computer to draw attention to the white figure that is almost completely faded from sight. 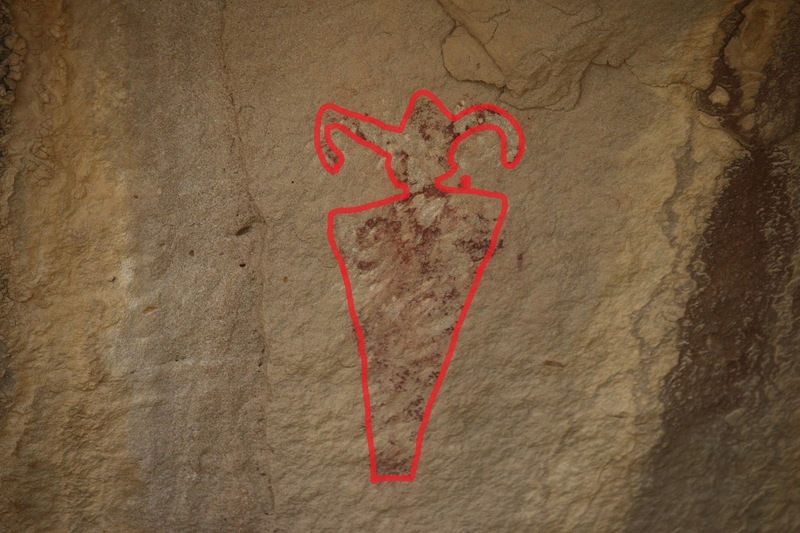 The carrot shaped body and the ghostly eyes of this image are similar to figures found in Sego Canyon near Thompson, Utah. There are a few smaller images off to the right of the main panel. Here is a picture of one of the smaller figures that was taken with a zoom lens. We made a rough outline of this one on the computer to show its general shape. Higher up on the cliff to the north of the main panel is a petroglyph very similar to ones that we have seen elsewhere. Note how the artist made a point of having one arm and one foot touch the crack in the rocks surface most likely to add a meaning that would have been clearly understood by his contemporaries. We aren't sure why the Hoodoo site isn't on the map and doesn't have a sign. As you can see there is a nice pullout along the highway with a trashcan and the site does have a fence to protect it. According to the map it also appears to be on public land. 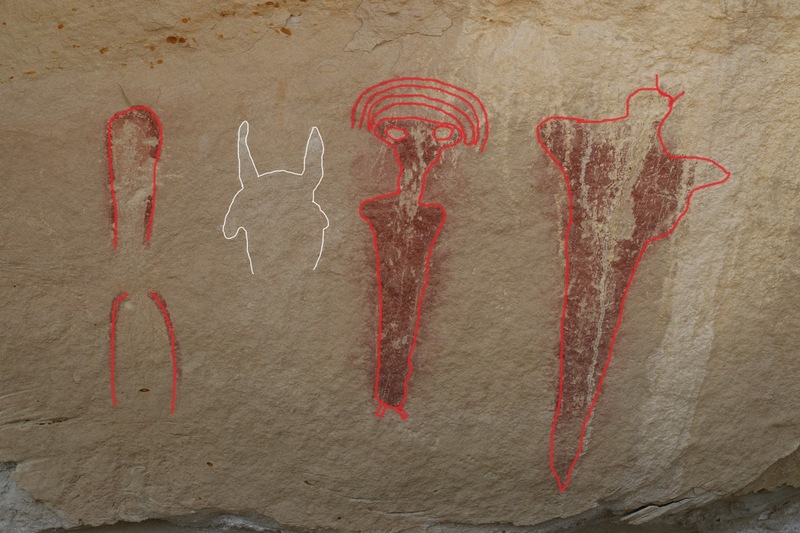 We first noticed the images here over 30 years ago and back then none of the sites in Canyon Pintado were marked. The site is definitely worth the little amount of time that it takes to visit it. If you would like to see it for yourself then all you have to do is 'Take a hike'.